Welcome to our exclusive guide to the best places to shop in York. Here we cover the top ten independent retailers, a mix of large and small - something for everyone! Exclusive Footwear is dedicated to bringing the best designer men's, women's and children's shoes and accessories to the North of England, and to provide you with an unmatched level of personal service. Proud finalists in the 2007 and 2008 Drapers Magazine Footwear Awards in the E-Retailer of the Year category, they consistently receive great feedback from their customers. Monday to Saturday 10am until 5pm. Browns are an independent family owned department store based in York and Helmsley. They have been operating for over 100 years and offer a stunning selection of different products under one roof. Bringing you handbag heaven with their new Radley shop and the most fabulous on trend handbag collections. And for that special gift, their Lingerie Department has all you need, with the most exquisite and divine collections of the season. They now stock a large selection of brands including Calvin Klein, Ted Baker, Triumph, Panache, Lepel, Charnos, Fantasie, Freya, and many more. The story goes that in n 1976 founder Victoria Bage, was about to expand her successful new business and open her first store when she discovered her lover was having an affair with his secretary, Sarah Coggles. Victoria did not suffer fools gladly though and on discovering the affair, she promptly threw him out and named the store after the secretary to remind him of the mistake he had made. From a quirky market stall in York, Victoria's own designs and brand offering had made an impact that created an avid customer base, which has remained faithful to the present day. One of the original Northern Boutiques, the store served coffee, played music and offered play areas for husbands, all of which were unheard of in York in the 70's. Three decades later, Coggles is a modern Boutique Department Store which collaborates with the best new designers and established fashion houses. If you want some extreme sports and fashion this is the best store around. Skating, Boarding, Skiing, Inlines etc plus all the best brands. A luxury store set in the shadow of York's grand Cathedral. This is the best place in York to buy fine watches and jewellery. They stock brands such as Oris, Jaeger-Le Coultre, Patek Phiippe, Parmigiani plus much more. Award-winning independant rare bookshop. 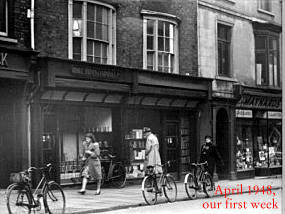 Based on medieval Micklegate this bookshop was formally owned by Edwin Storey, it now occupies all four floors of the elegant building. The ground and first floors contain their large stock of out-of-print books, high quality publishers' reminders and gallery area displaying early English watercolours. They have two rare book rooms and at the top of the building, have a book bindery. More than just a children's toy shop. The Christmas Angels store on Petergate is an all-year-round wonderland of fascinating Christmas accessories, traditional wooden toys, clock-work toys, with a wide range of teddies in the first floor bear gallery. Also sells novelty items and decor. The Christmas Angels Shop is run by Chris and Pauline Kirby, and their team of assistants who ensure a warm welcome to all visitors. Robert Smart Menswear is a prestigious, independent family run menswear store situated in the historic centre of the beautiful City of York, located in Low Petergate, midway between the Minster and The Shambles. They are comprehensive, offering of clothing from leading British and continental suppliers. These include Canali, Carlo Viscontti, Desch, Magee, Meyer, Saint Hilaire and Wilvorst, all of whom produce fine tailored garments. To complement our clothing are shirts by Canali, Eton and Eterna, plus a vast selection of silk ties to suit all tastes. Ladies and Gentlemen, we welcome you to the unique and glamorous experience of Elizabeth Wells. Renowned for their superb quality of luxury hand-made chocolates using the very best fresh ingredients, Monkbar Chocolatiers make small batches of over 60 varieties of luxury hand-made chocolates. A must visit for those with a sweet tooth!